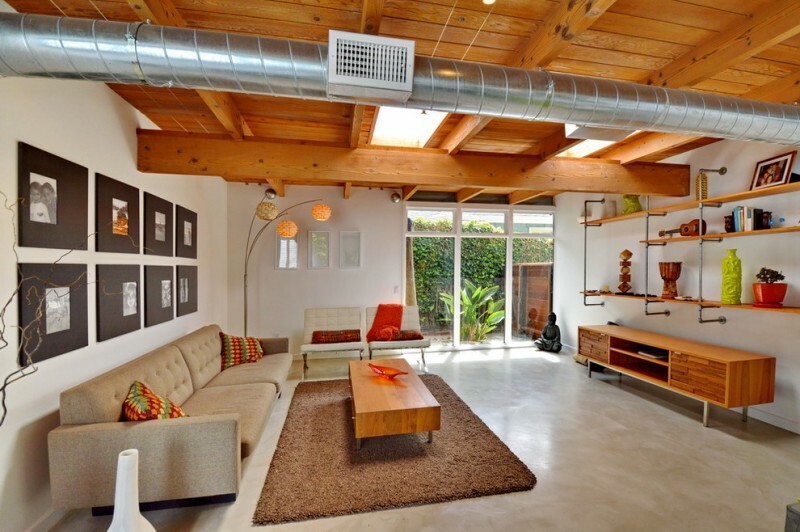 Midcentury modern house – midcentury modern is one of architecture ideas created by forward-looking believers. They regard this architecture idea can be an effective way to change the society through architecture style to achieve a better society. 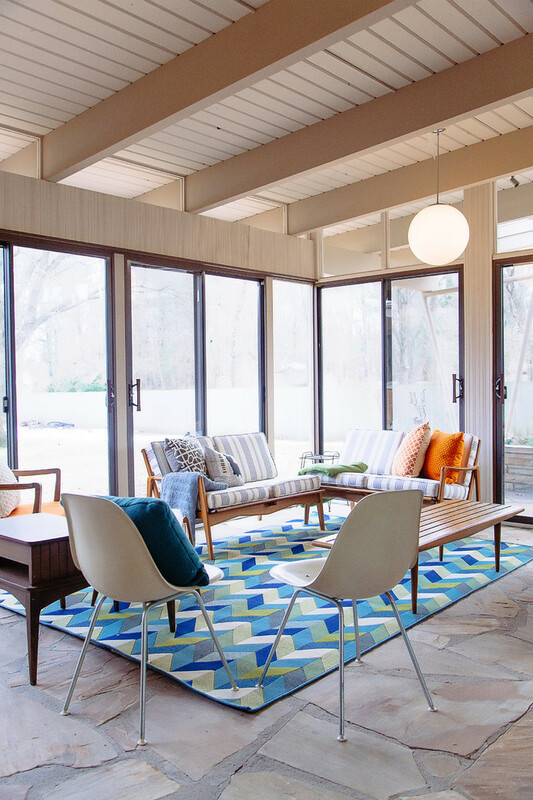 Midcentury modern architecture has some typical characteristics such as large glass doors and windows, flat planes, clean lines designs, and open spaces. It also commonly features something natural by including the elements of nature within the architecture. Why? 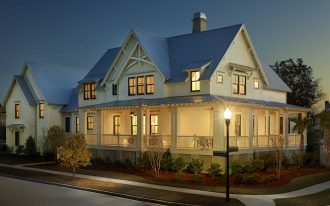 To encourage the homeowners in exploring the world through their personal style is the reasonable answer. 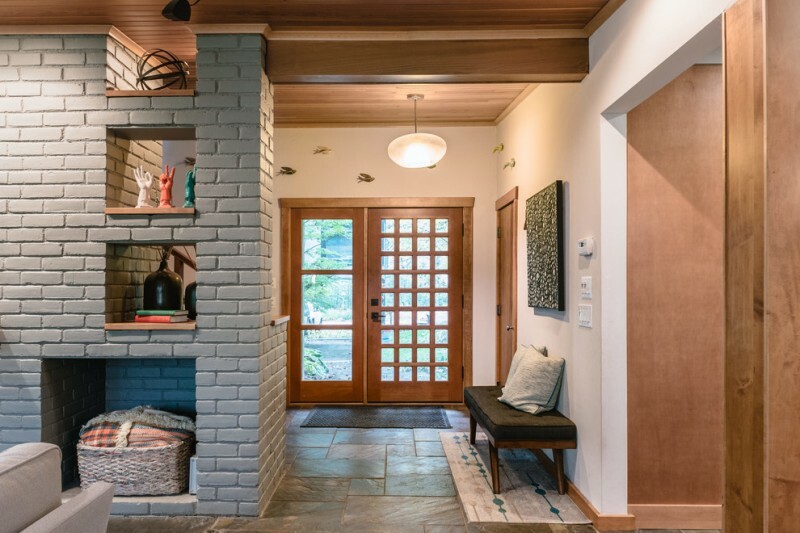 Probably you are so curious what midcentury modern looks like, and what ideas you can adopt from this architectural style. Well, to see more details about midcentury modern architecture idea, let’s check these tens inspiring designs of midcentury modern house. Wish that these ideas would be big contribution for all you guys. Let’s check it out. 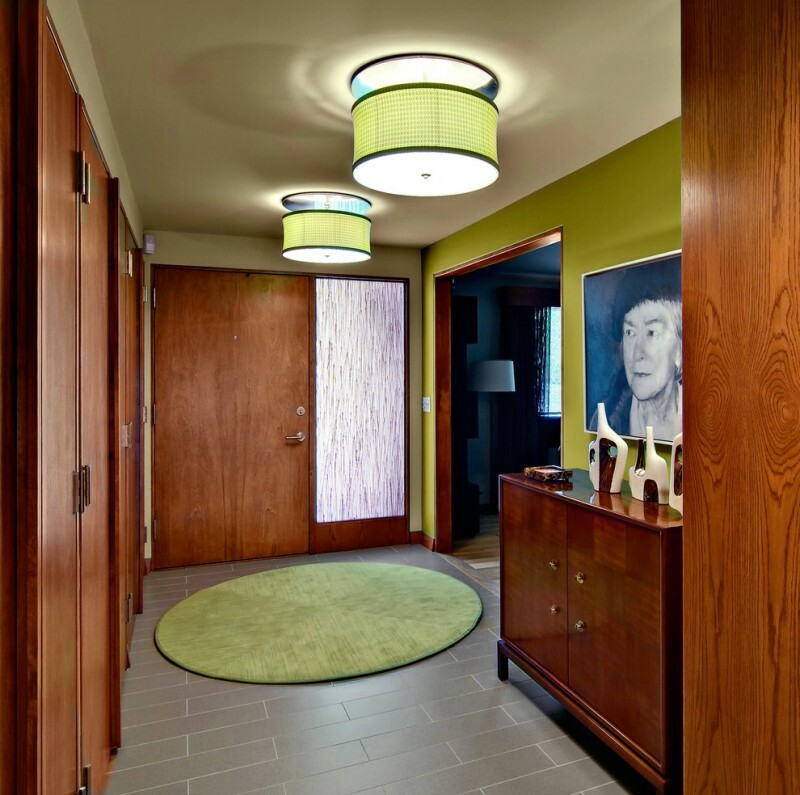 Large glass door exactly refers to midcentury modern concept. The door allows us to expose the back yard where we’ll find lots of greens and other natural elements. The furniture choice, in addition, points out the simplicity of clean lines design and material use. 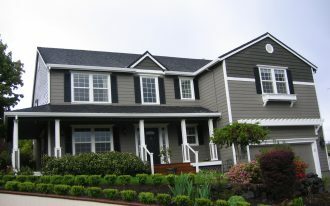 And the color, furthermore, neutral and earthy tones prefer to choose instead of pop of colors. An atrium with updated midcentury modern style. I love this space where we can centralize a fun-welcoming-guest here. Textured modern walls and huge glass windows are contrary but perfect to combine. Stone borders attractively heal this ‘tired’ base, adding different teak wood decking floors. 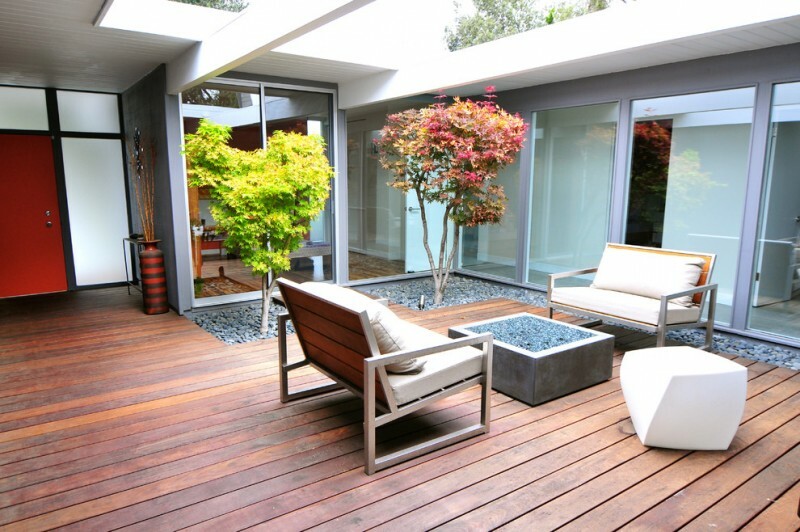 I always love a screened patio. It’s outdoor but comfortable and well-covered, providing a shelter from bad weather or sun heat without missing the chance to enjoy the view outside. If you’d like to combine modern style with something natural and fresh, probably this idea fits you. 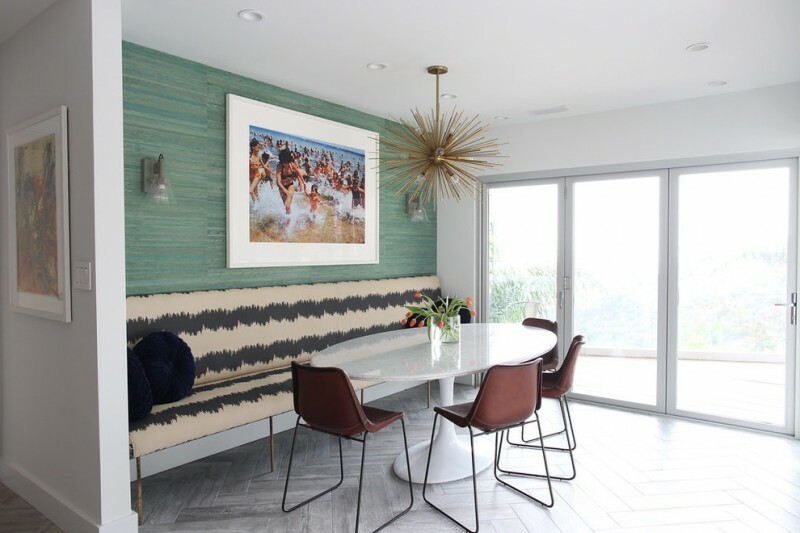 Midcentury modern furniture set featuring modern-patterned area rugs will work well with some hanging decorative plants spotted in strategic corners. 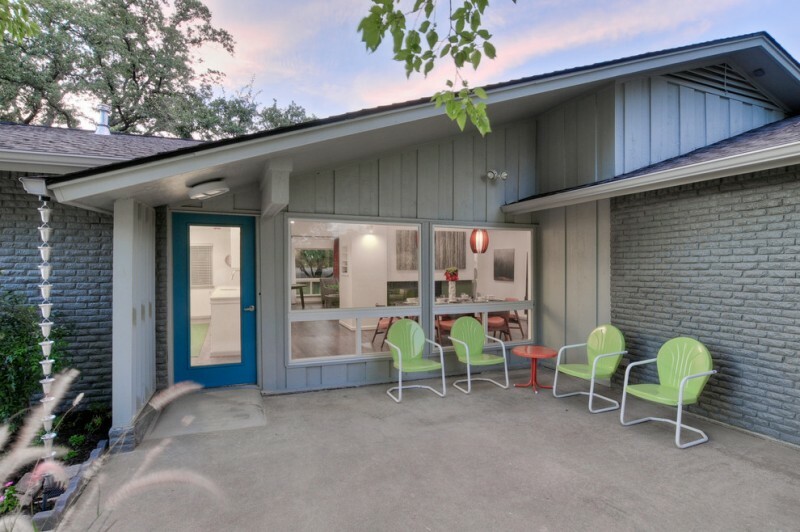 Still about midcentury modern sunroom. 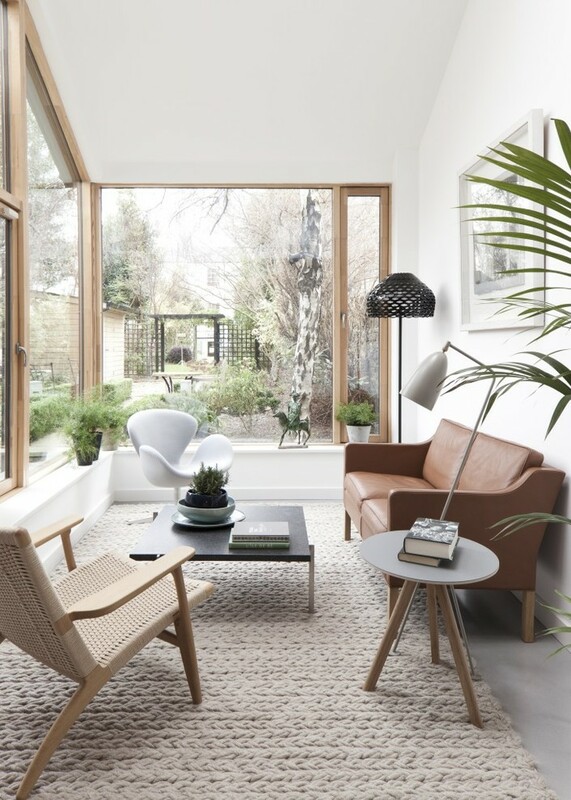 Give multi-choice seats for your sunroom and select the varied ones. 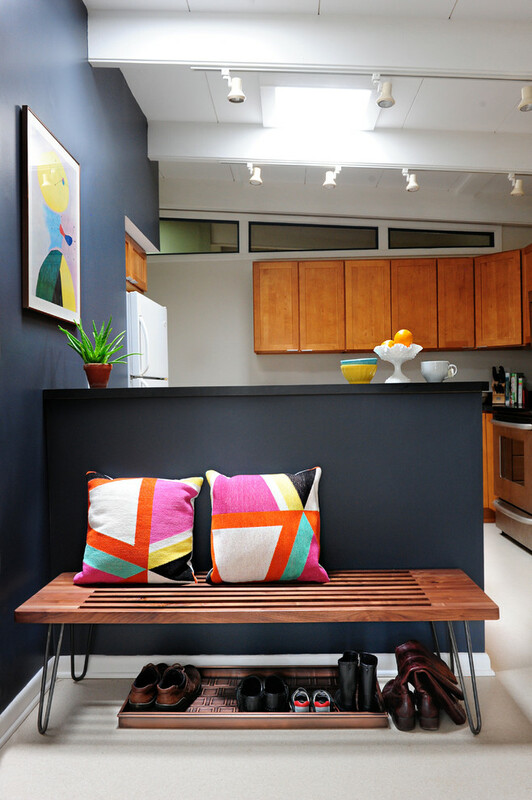 Wood bench, loveseats, and typical midcentury modern side chairs are available for filling such a space. Accent the slate floors with multicolored area rug. That’s would be an inviting spot. I’m impressed with the skylight that provides plenty of warming sunlight directly to its beneath space. White applied on both sides of walls are the same but different in texture. 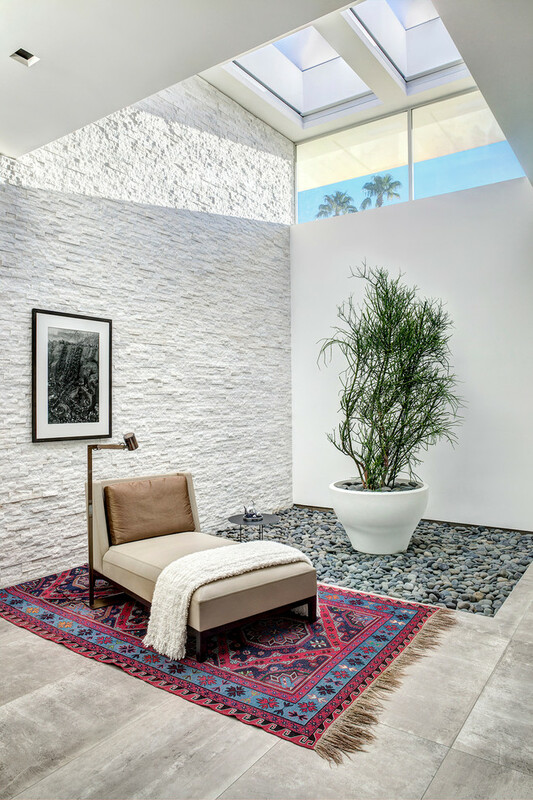 This difference obviously enriches the interior style, and offers a beautiful contrast to all objects within this space, including plant, rock border, Moroccan rug, light fixture, wall decor, and even single daybed. 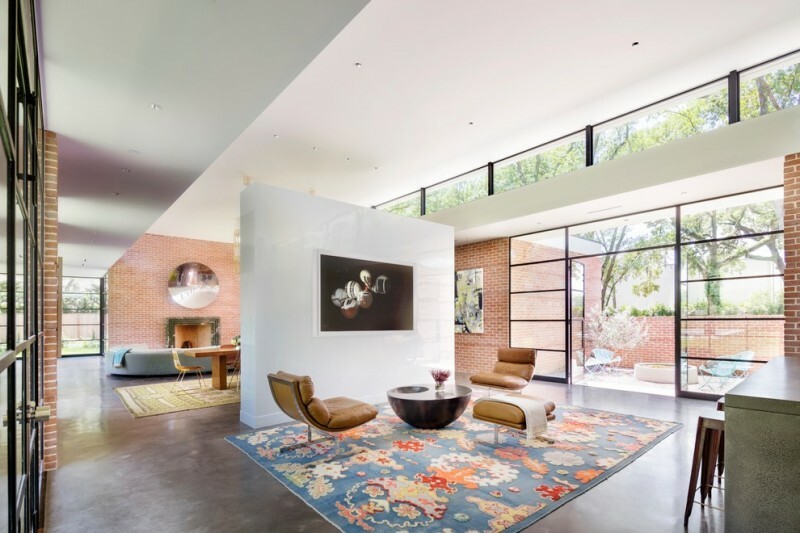 An open concept space – one of main characteristics applied on midcentury modern architecture idea. Concrete room partition here ideally separates two different spaces without giving a real border between them. 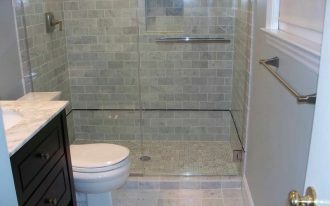 This offers a privacy and larger access for moving any spots in this room. I can say this idea is quite perfect for you guys loving to mobile here and there. 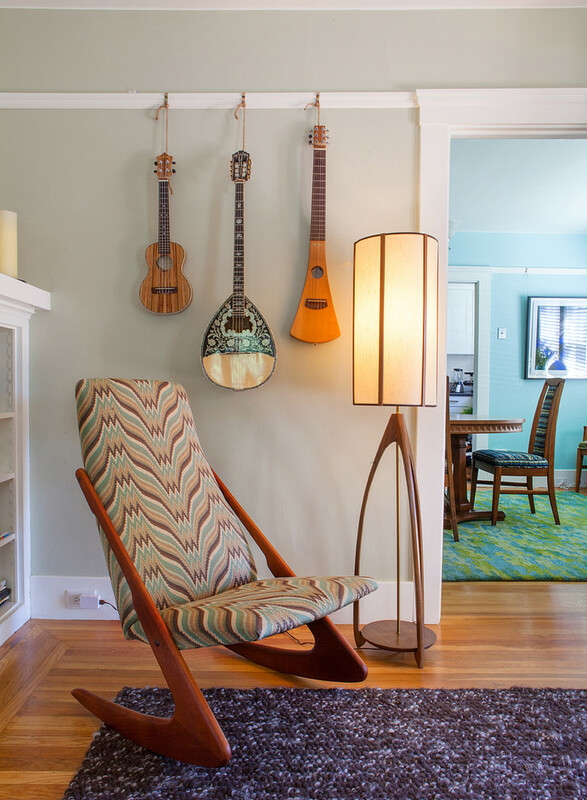 Midcentury modern rocking chair is furnishing a vintage-concept seating area. The furniture perfectly fills the room with powerful character and charm. 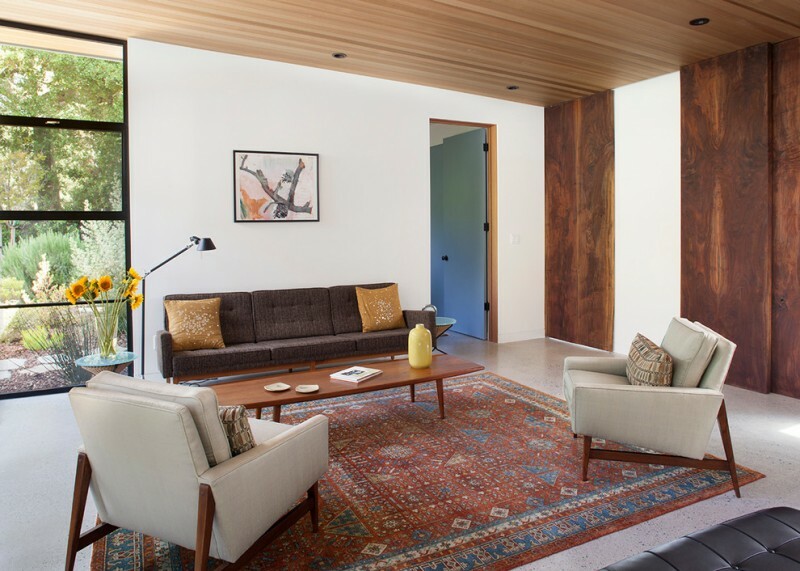 Picking the homeowner’s childhood memory and currently midcentury modern furniture assists to create a historical interior. A simple red armchair featuring classic wood hall console – a perfect combination to give a modern concept with classic appeal. Use sofa and chair with different design and color to enrich your living room. Accent it with classic or traditional area rug that perfectly covers your dark wood floors. This idea surely gives you a beautiful contrast, especially when you’re making such white walls as the complement. What a comfy bungalow is. It fills of colorful furniture. The radiant tables amazingly beautify the space when the dark comes, giving a wonderful lighting effect to the space and surrounds. 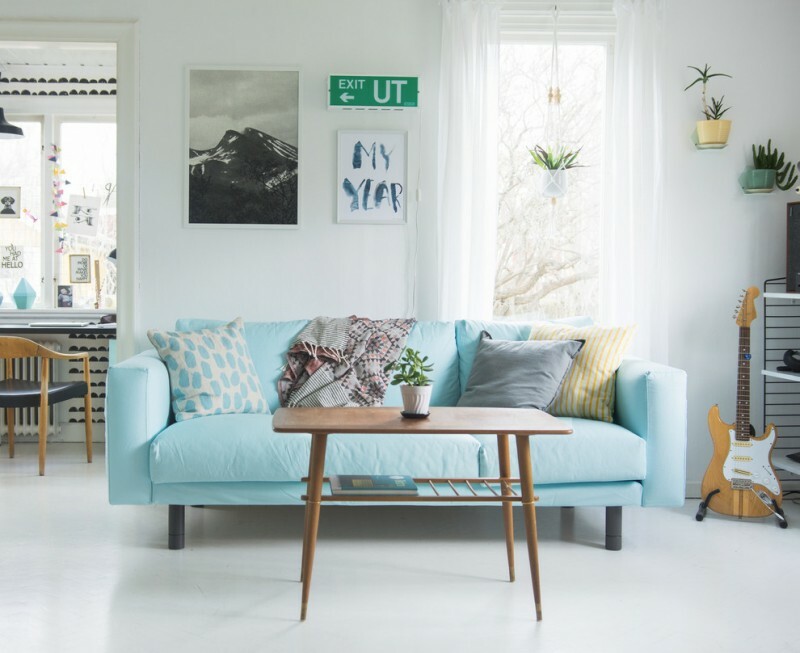 The couch’s color impressively adds an obvious contrast against the white walls. It’s totally different with the grey chair that softly contrasts with the sidewall’s staircase. A small and fancy living room design filled with high quality leather chairs and simple pointed-leg side table. What makes this interesting is the layout that focuses on simplicity and functionality. More ornaments aren’t necessary. 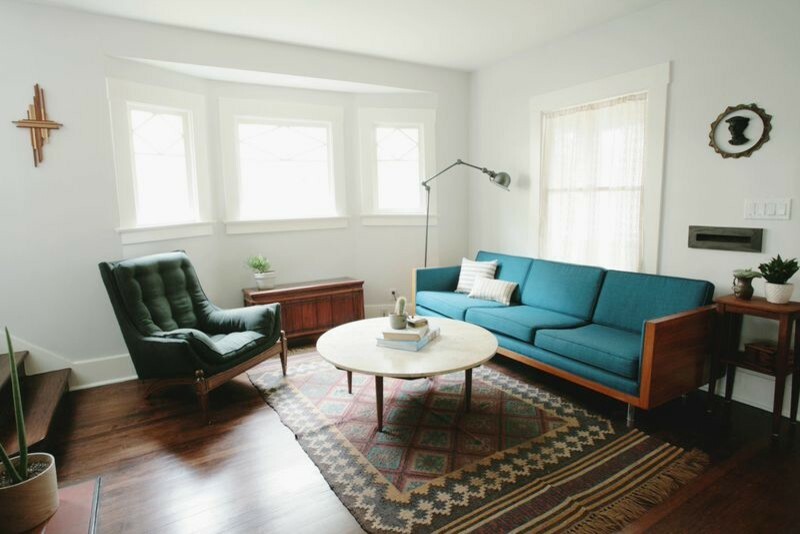 Simply create your own living room with such a set of midcentury modern furniture. 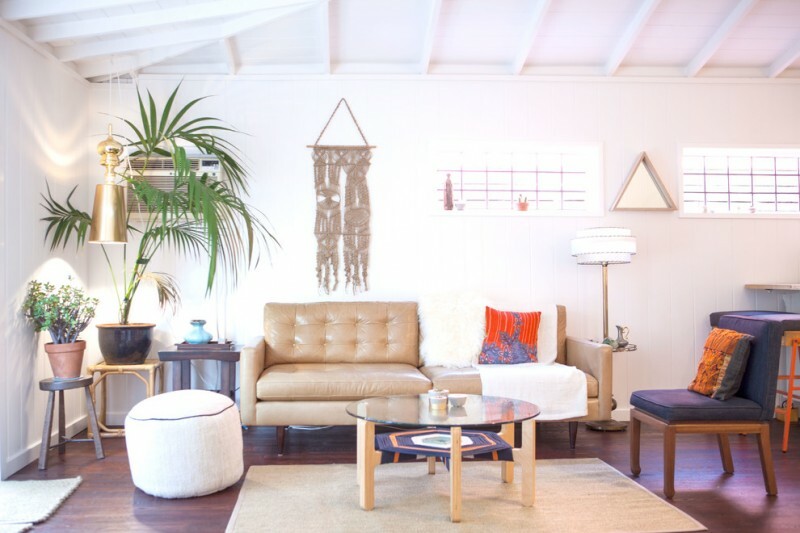 Improve them with other complementary items such as area rug, side chair, and some decorative side tables for plants. Select the best lighting for producing the warm and cozy-look lighting effect. Old and shabby, a physical look of chair you can involve into your midcentury modern living room. 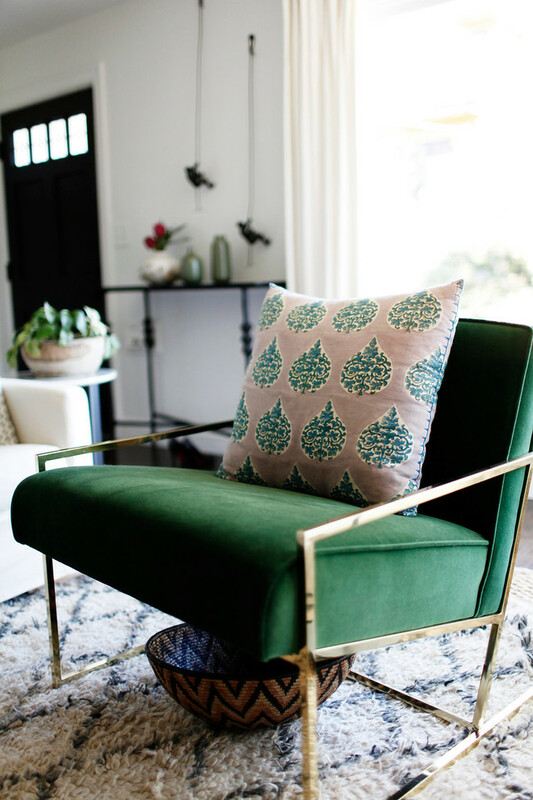 You just need to add an accessory like a throw pillow for make it fresher and newer. Keep some parts seem old; this is an important part you can highlight to achieve your dreamy living room. This is called a rustic-midcentury modern dresser. 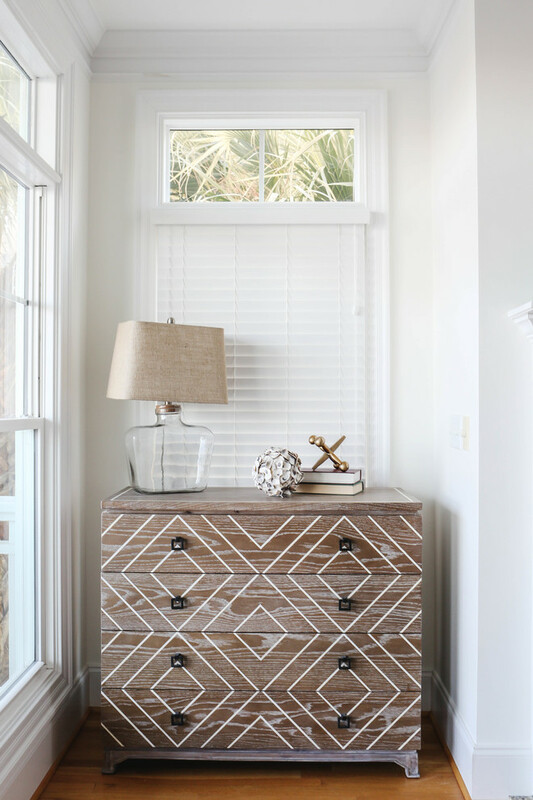 It’s highlighted by white line accents that form a particular pattern, adding ornamental and texture on the dresser’s face. The table lamp with clear glass table is really unique, it doesn’t destruct the view nearest it. 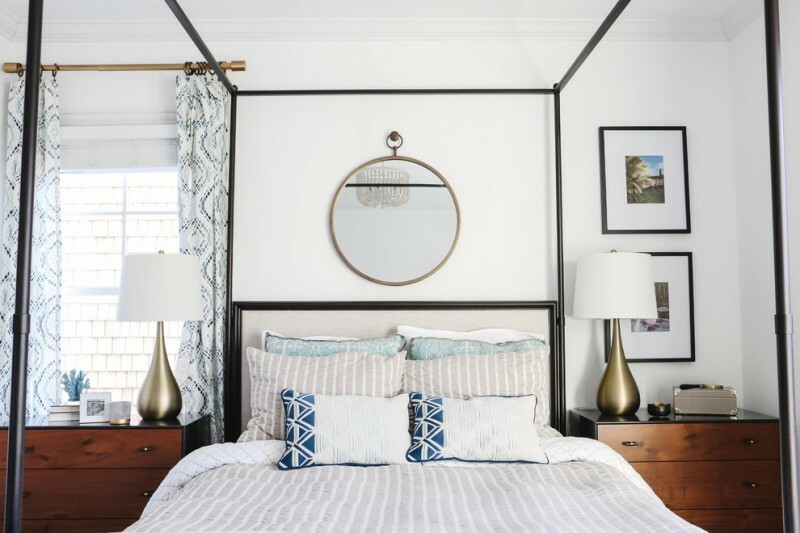 A queen bed with canopy and upholstery creates a light midcentury modern appeal for a guest room. Black-finishing bedside tables and additional dresser blend together with brass mirror and decorative lamps. Another midcentury modern bedroom idea with coastal theme. 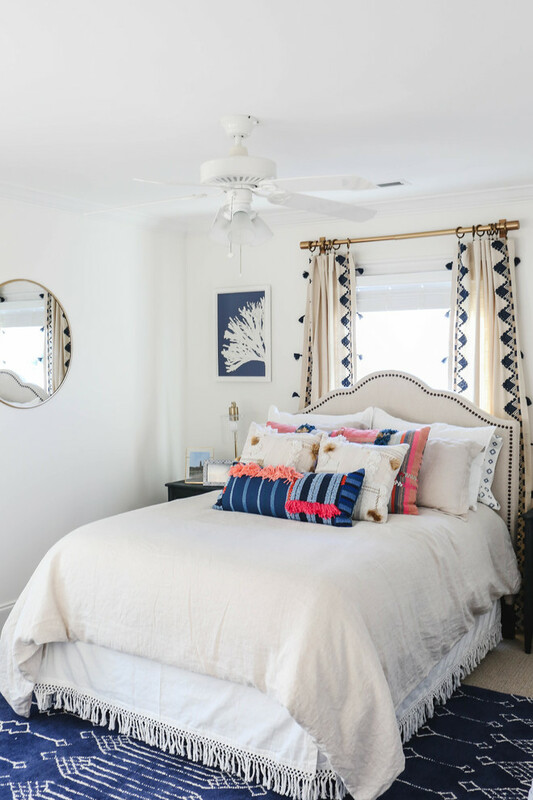 The upholstered headboard has been perfectly framed by a great window curtain, giving an ornamental as well as functional purposes to this space. 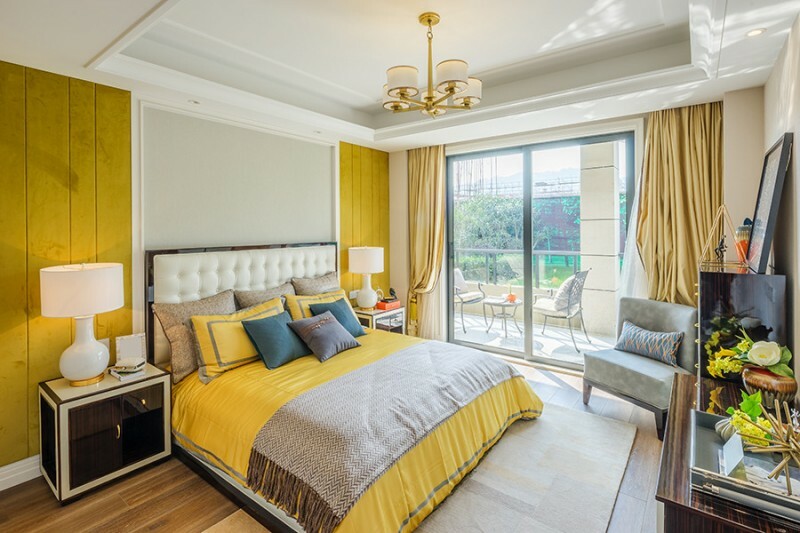 If you notice more on brass curtain rings and rods, they’re exactly similar to the brass mirror mounted on wall. The bedskirt which is made of tassel brings a coastal retreat when it’s combined with this navy blue rug. 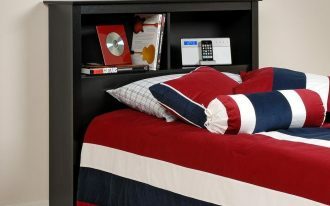 This is fun bed furniture for your twin. 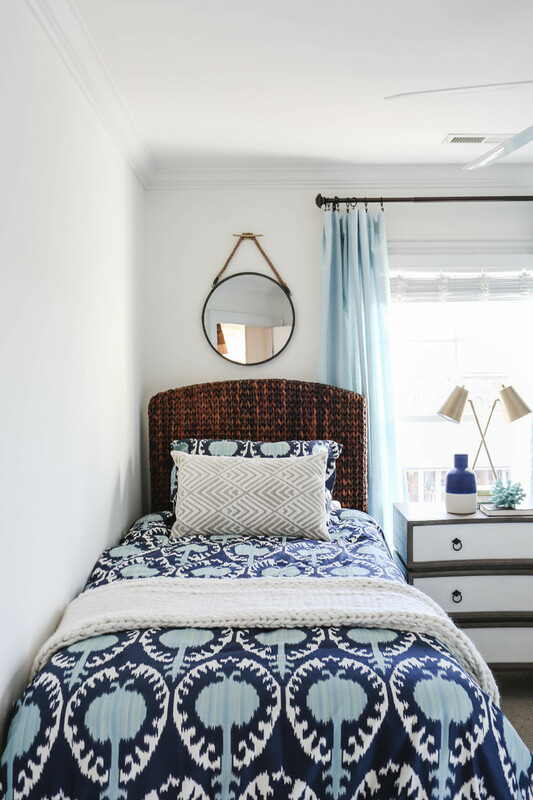 The bed is covered in navy, oyster prints, and blue. 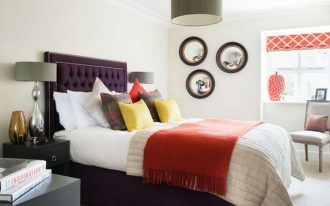 This combination produces a pretty stunning yet contrasting look against the headboard. 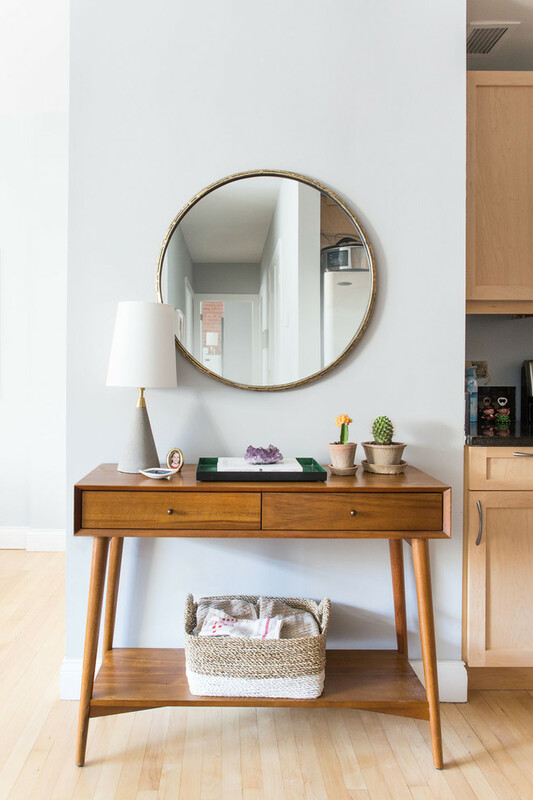 The dresser and hanging mirror bring more midcentury modern appeal that you can purpose them as your most favorite focal points. Tufted upholstery on the headboard, this is one of midcentury modern characteristics most applied on the beds. Frame it with something different for a contrasting look, and make pop of colors as the matched pairs. Yellow probably fits the bed and make both look in good balance. 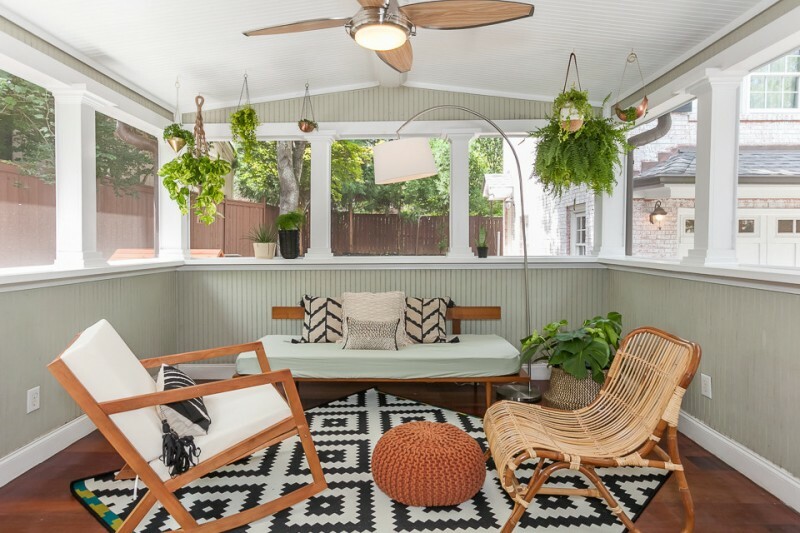 Fill such a stylish exterior furniture set for your open porch and get the personal style as you want. Pop of colors are always long-lasting and can stay charming for years. Even these midcentury modern chairs can be used by your generation. 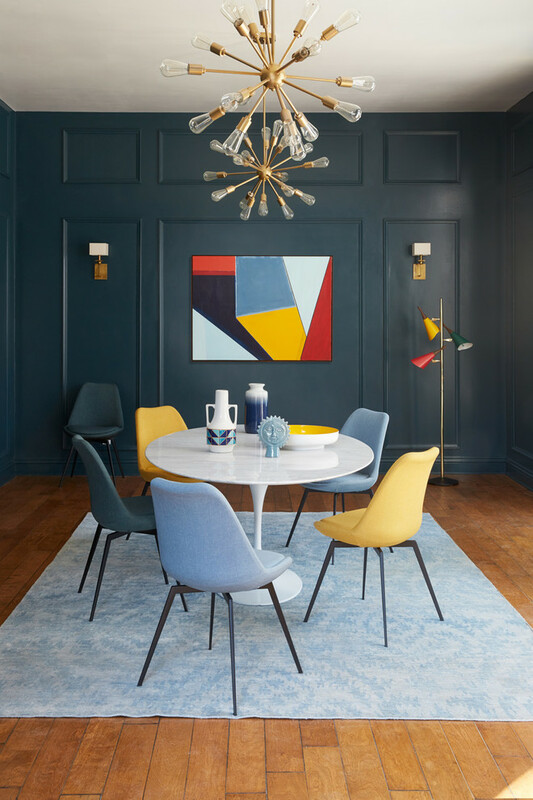 Use the playful tones to colorize your bold grey interior. 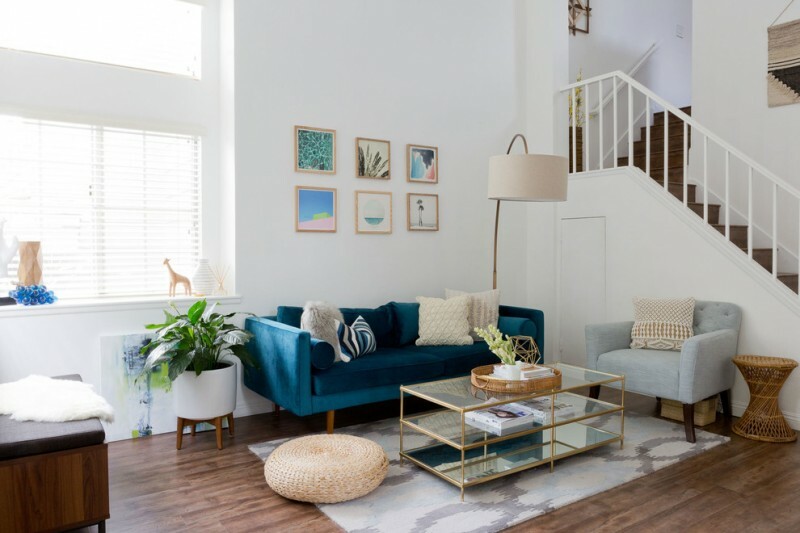 They don’t have to the primary interior items like furniture, you can apply those playful tones for the ornaments or accessories such as throw pillows, wall decors, or even other kinds of room beautifiers. 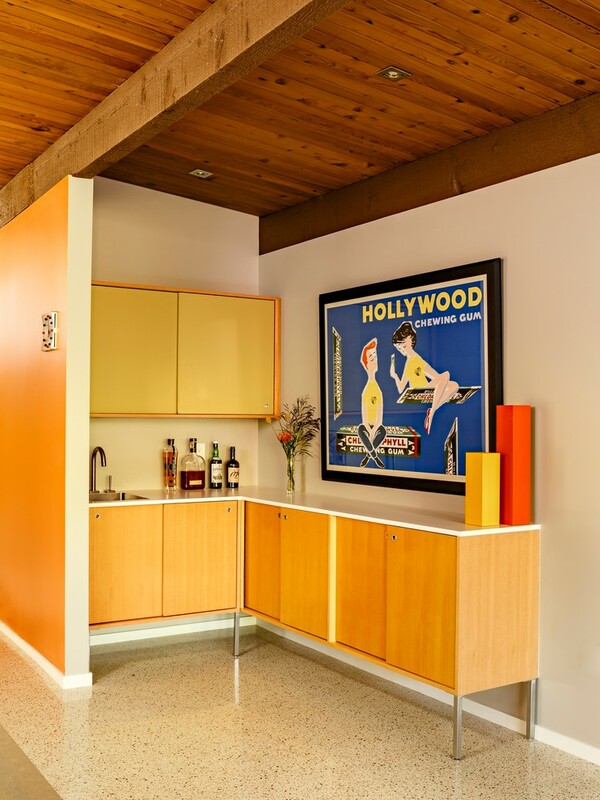 This is inspiring midcentury modern wet bar in Portland. 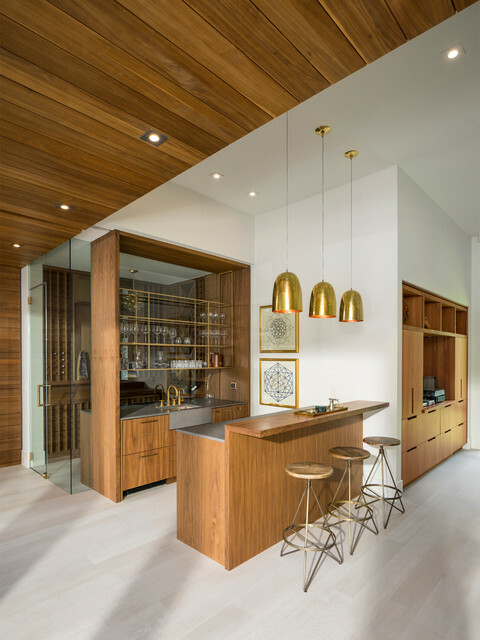 The designer purposely involves L-shaped flat-panel cabinets coated with medium-toned wood finishing to create a warm and clean lines look in bar. Higher-legs on cabinets here are really well-recommended for slimming visual effect, so they’re good for smaller modern bars. 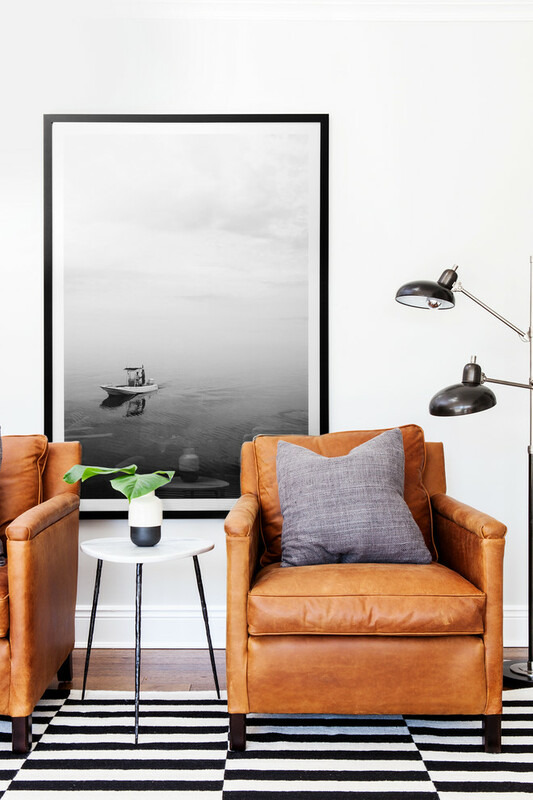 Just give a simple and less numbers of wall decor for a minimalist wall performance. 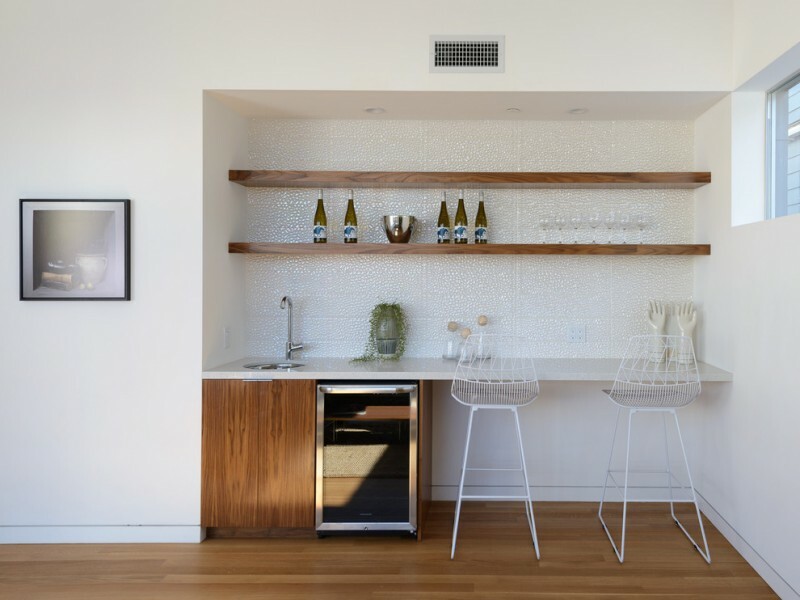 Clean white interior becomes the best media for any interior items, including wooden bar kitchen furniture. Modern design applied on all furniture sets and accessories blend well with the room, obviously create a contrasting and natural appearance in this modern bar kitchen. The pendant lamps, furthermore, are greatly performing a modern industrial appeal. A formal living room with midcentury modern furniture set. The different furniture shows their own style, like their skinny legs made of stainless steel. Such model of furniture actually displays what most midcentury modern really is. 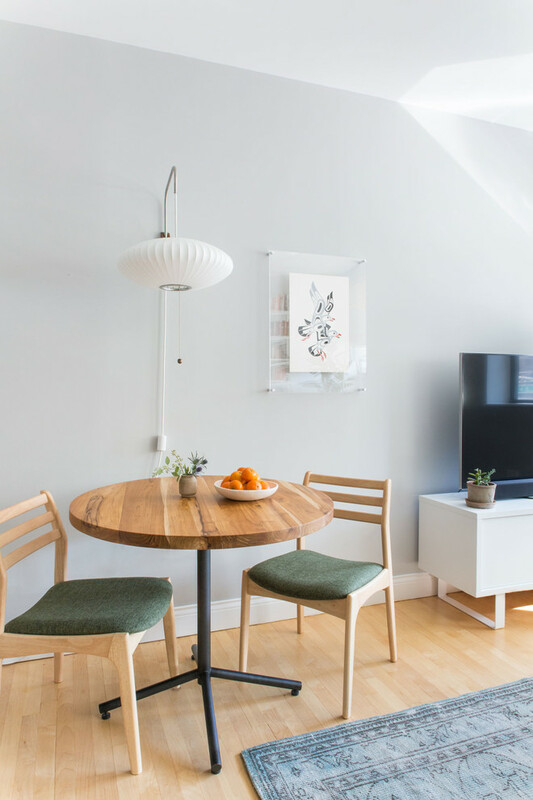 The exposed wood beams on ceilings might work if we use similar wood for several furniture items like this modern center table and TV console (no TV). The additional floating wood shelves supported by iron holds bring a bit industrial look. 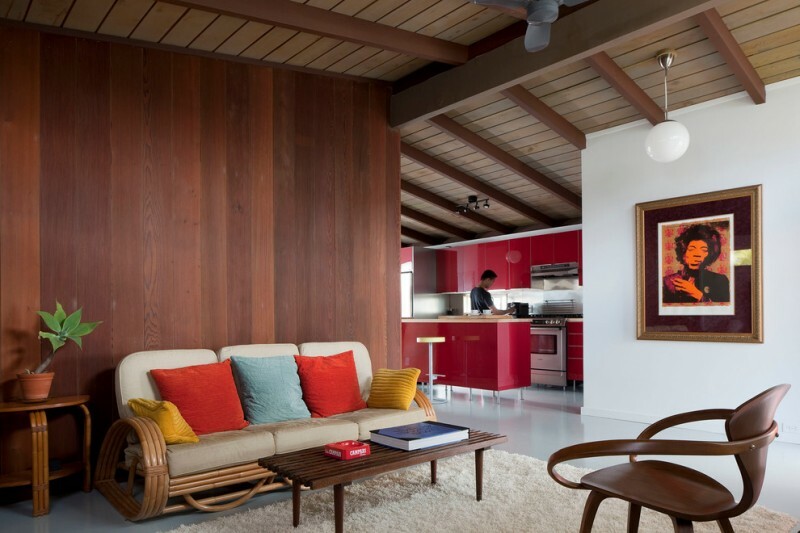 Midcentury modern furniture is a good choice for such a large and semi-formal living room where we’ll discover something natural exposed by raw, toned, and textured wood wall-panels. They offer a contrast against pure white wall system. 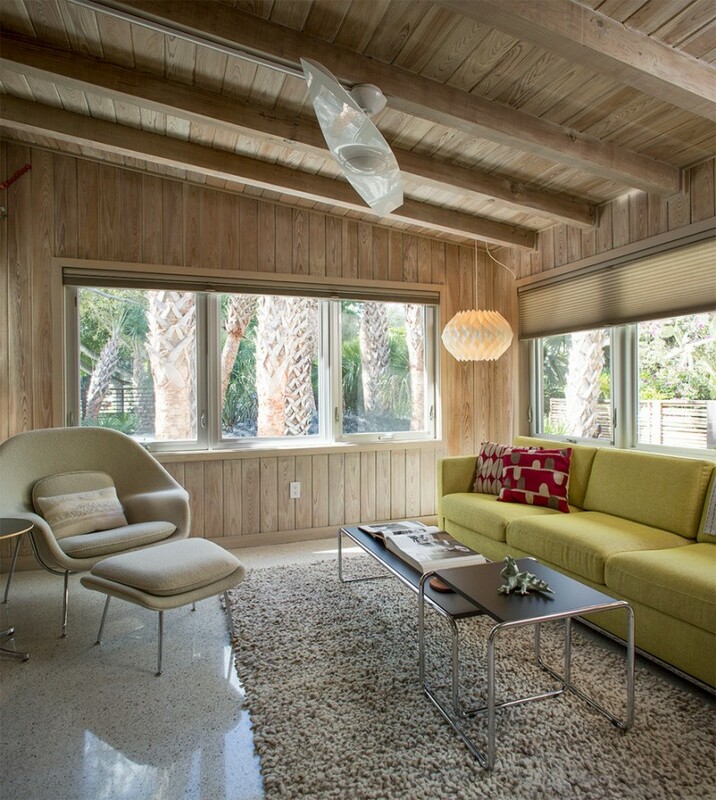 A stunning midcentury modern couch among the bold interior. Make small side tables as the best pairing stuff that complete the couch. I believe this spot will be the most favorite. 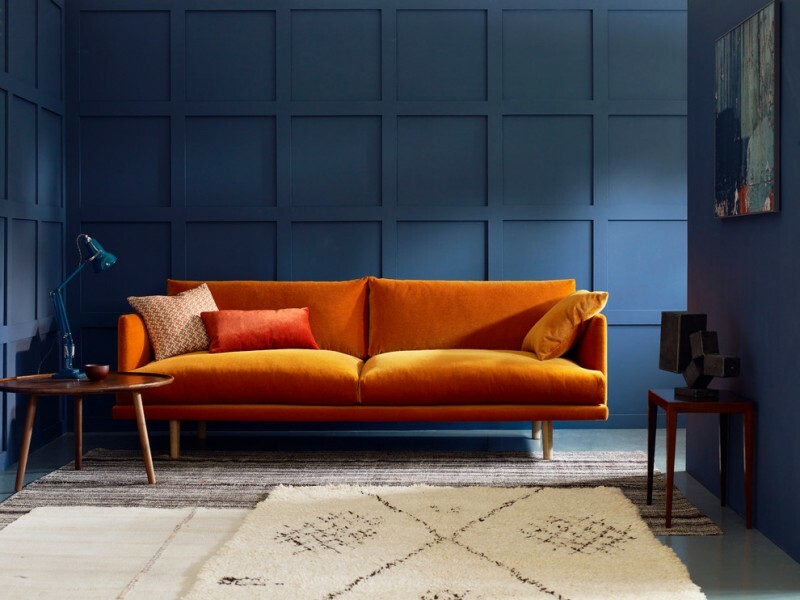 The couch amazingly makes the room more stylish and soft in look. Skinny and high-legs coffee table really acts like a modern vintage complementary item for this couch. Overall, they’re so charming in their own way. It’s gonna be so wonderful if you fill your open-concept living room with such a simple furniture set. The dark-finishing wood wall probably gives you a unique wall background for your soft-toned couch. Add pop-colored throw pillows for the color accents and let your dark wood table and chairs create a modern yet natural appeal. 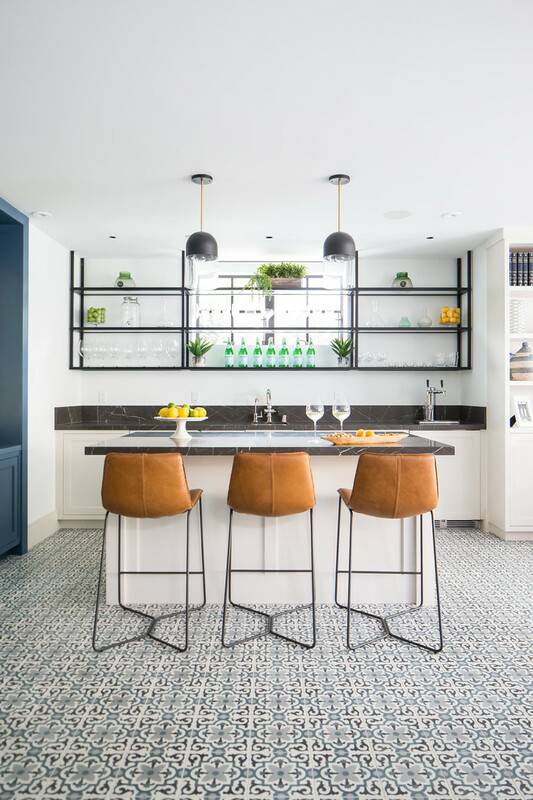 This is an ideal wet bar design furnished with dark marble-top kitchen island, bar stools, shaker cabinets, and industrial-style wine glass shelves. I’ts so simple yet available for many purposes. The stools aren’t only stylish, but also they’re so comfortable. 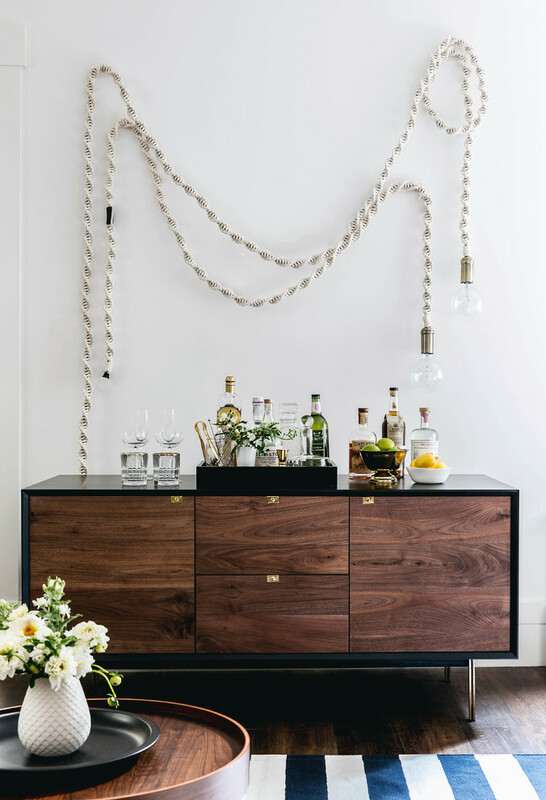 What amazing this small bar cart is! It shows gold-toned finishing in more details, exposing amounts of elegance that’s directly grab everyone’s interest. Simplicity brings elegance. Merely with two rows of hardwood shelf mounted on wall, you could make them as a functional & stylish display for wine and glasses. Complete it with simple white countertop plus flat-panel cabinet for a practical storage, and add a couple of modern bar stools for seats. Take a look at the hall console. It originally exposes the real tone of hardwood as the main material. It also keeps the genuine texture of real hardwood. Black frame here is the best option for wrapping this furniture since it makes the wood color stands out. I honestly love this console so much after it’s exactly set on the corner with white wall as its background. 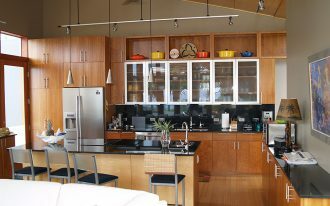 What makes this open-concept kitchen interesting is the wall decors that consist of beautiful wall-mounted bottle-stands. The lighting effect customized on each bottle-stand helps the bottle’s color softly flaming. This idea is a good recommendation especially for such light-toned interior. 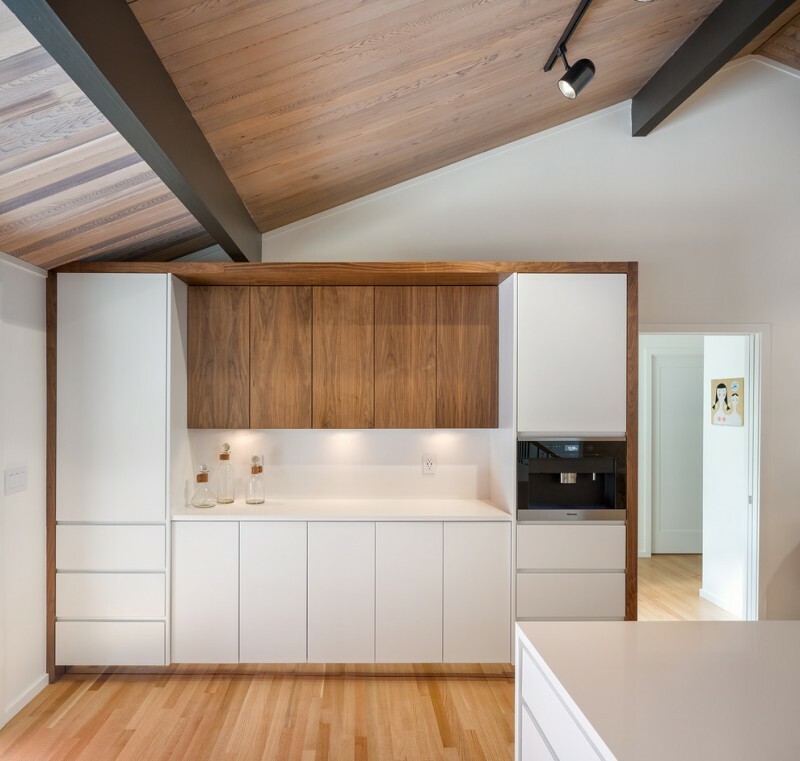 White and wood color combination for a midcentury modern ranch kitchen – a good choice for a soft and clean lines interior. 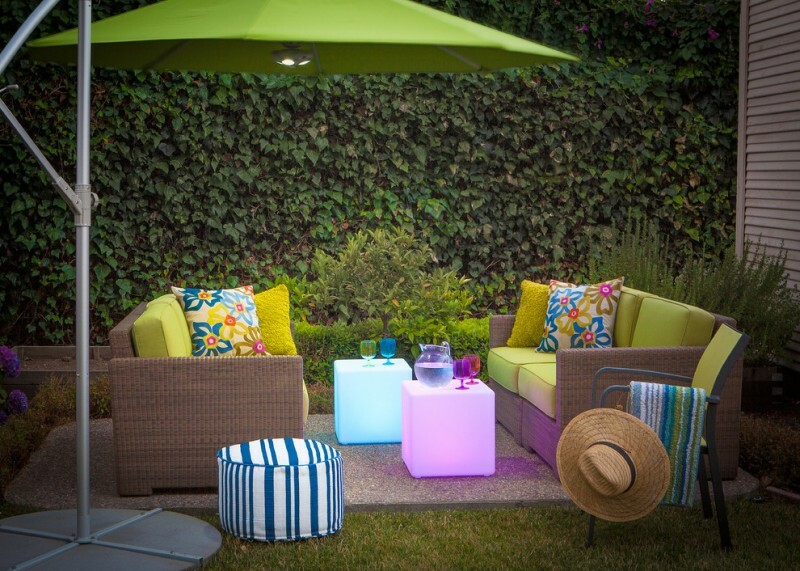 Add low-lighted lamps for dimmer light effect that practically offers warmth and elegance. 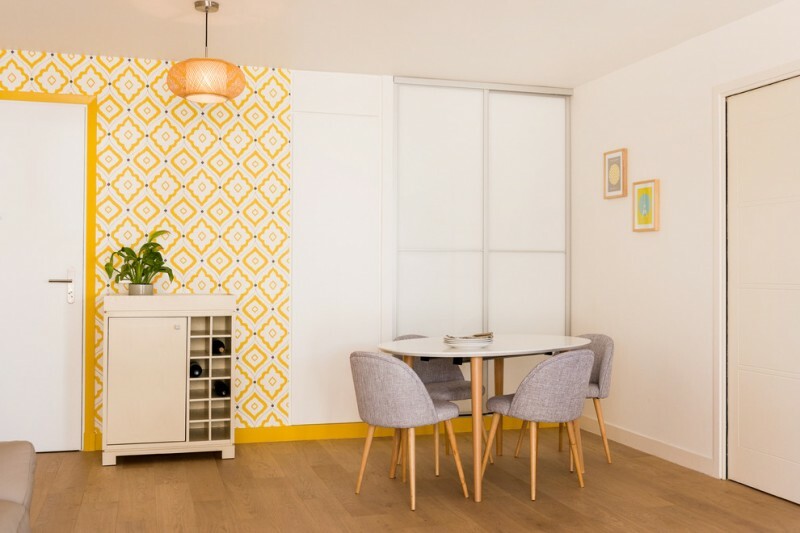 Yellow wallpaper is set side-by-side with white wall for the background. Add c a cluster of midcentury modern chairs and their complementary round table for a cozy seating area. You might also want to complete the room with a medium-sized wine storage as the beautifier. It’s fine if you want to add a long couch as the additional seats in your dining room. Set it up nearest your dining furniture and create a larger dinner/ breakfast area in your lovely home. 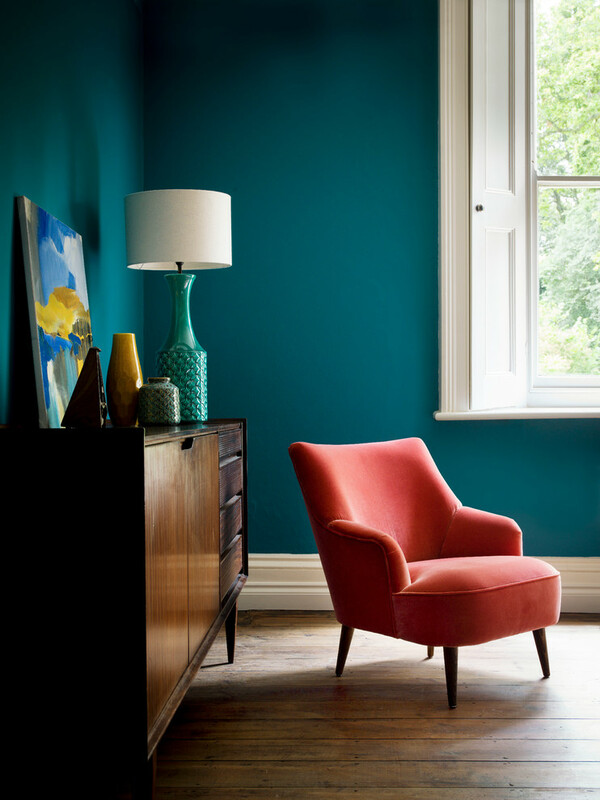 Just use the playful colors to get rid off your old & boring dining room look. You can apply the colors for walls or even for your couch. 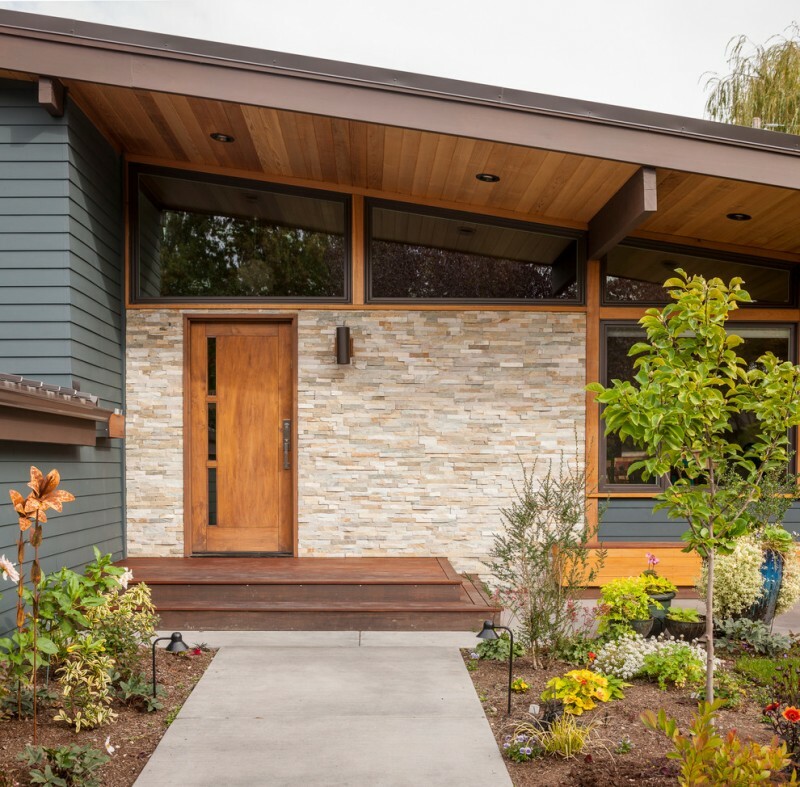 An inspiring midcentury modern exterior idea in Seattle. 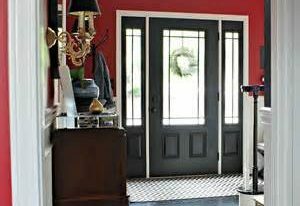 The designer chooses medium-toned wood front door instead of darker one. It keeps bolder when it’s combined with another light-toned exterior wall like this whitewashed wall. The slanted roofs supported with darker glass panels on top surely give modern touch. 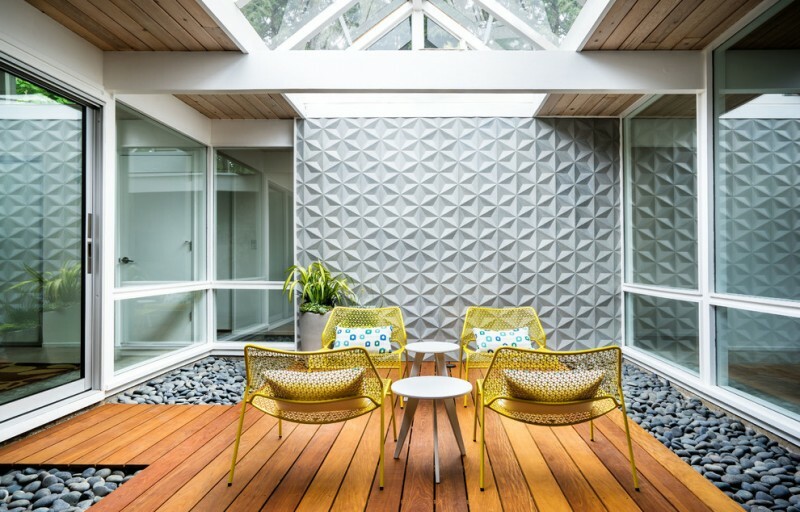 The designer also prefers grey siding for walls instead of stones or bricks. Why? 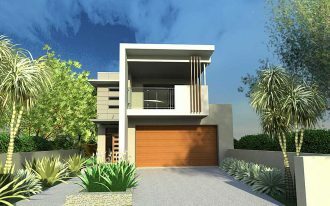 Probably he wants to emphasize the modern look through the simple and clean lines exterior. It’s really O.K if you want to give something different to your hallway for an aesthetic purpose. Grey-painted bricks panel with large ‘windows’ for decorative storage units. Yes, it’s common to add a bench in your hallway, but it will look so different if you add a huge brick wall or panel with your ornament collections. Green gives an effect of freshness. Just use it a bit for interior and ornaments to add an interesting tone among these dominating wood interior and furniture. 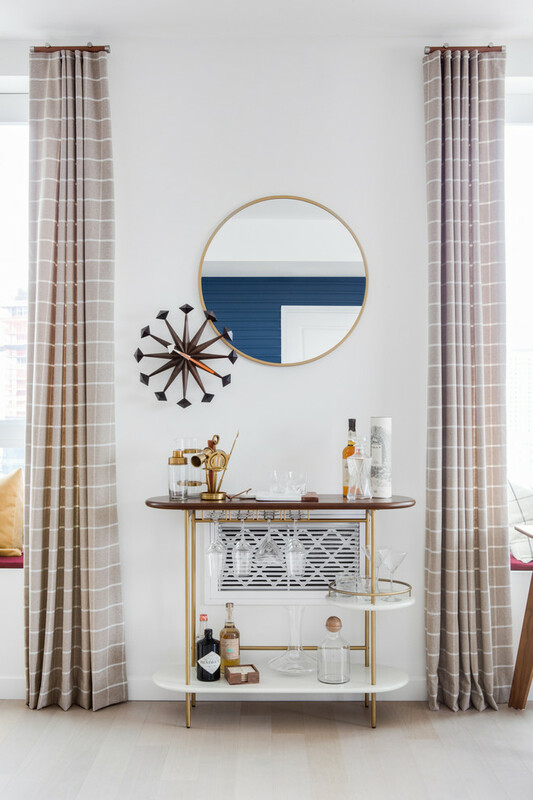 Super simple hallway – a round mirror with thin brass iron frame becomes the focal point as well as a console’s complementary item that provides function. High-legs furniture helps to create a larger visual effect in the room, a good choice for a small room. Neutral and soft color also support this idea since it doesn’t have a potency of distracting the existed interior’s tone. It’s fine to add one playful color in room for a color accent that can make this room much more interesting. A dining nook which is replaceable for a playful game for kids. Provide a cozy space for playing cards or board games while enjoying your meals and drinks. It’s nice place to welcome your friends or special guests privately. And, a geometric pendant lamps and a custom dining sofa with playful fabrics are gonna be the direct focal points in this room. 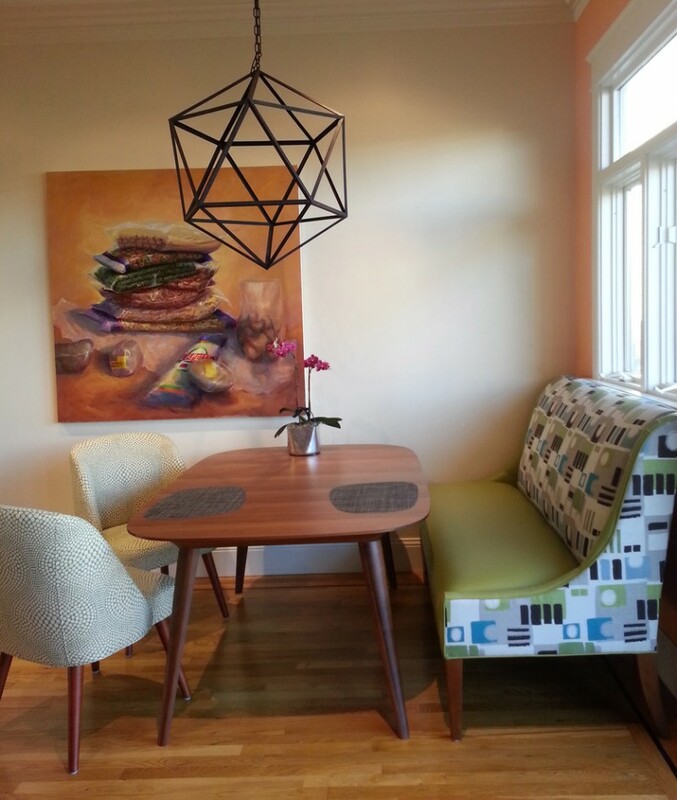 A scandinavian style open-concept dining room featuring light furniture items – Here, the homeowner uses white-lighted lamps (for both the recessed lamps and pendant) for resulting palely bright lighting effect in this room. I think it’s a perfect choice for such light interior. An open-concept kitchen and dining room supported with a stylish staircase and railings. 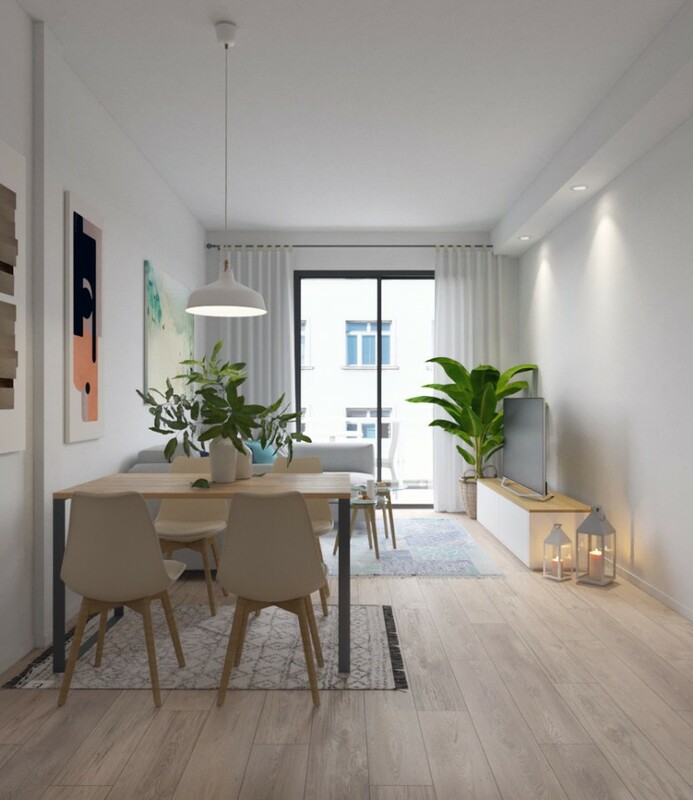 It seems the homeowner is a big fan of light wood used as the main element of kitchen, and white is a perfect choice for pairing that element. 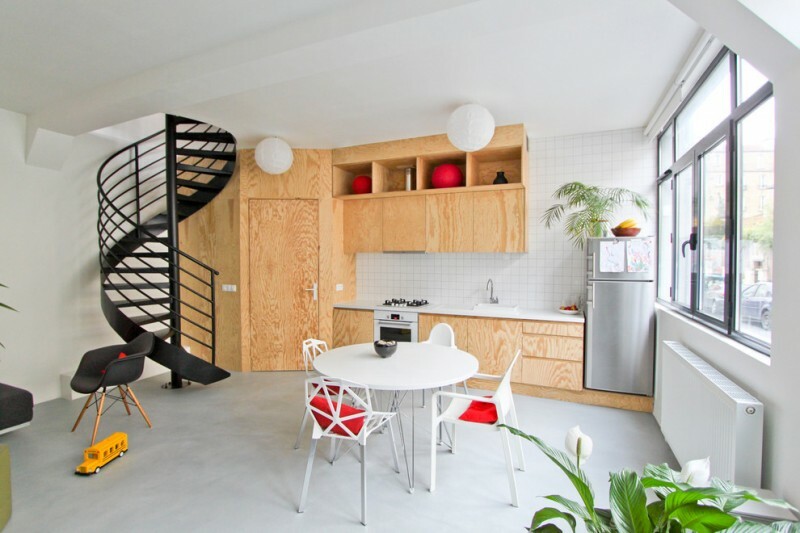 Half-spiral staircase with railings here adds another modern appeal in this room. Wood panel for wall is likely effective to add another tone and texture instead of common concrete wall. 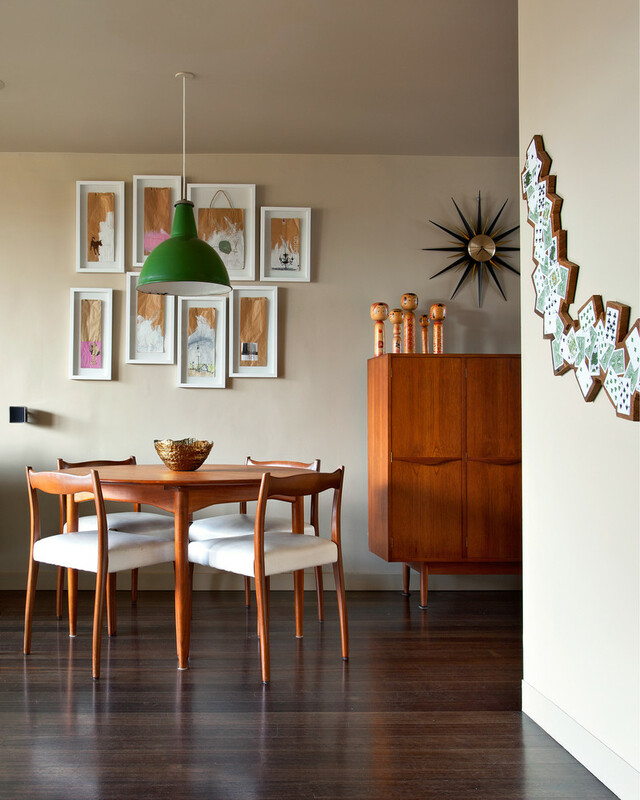 It’s more interesting as a wall background especially for such fabulous midcentury modern dining furniture. More various color of furniture like chairs and table also give ‘value’. It’s recommended to adapt this idea if you’d love to remodel your house. 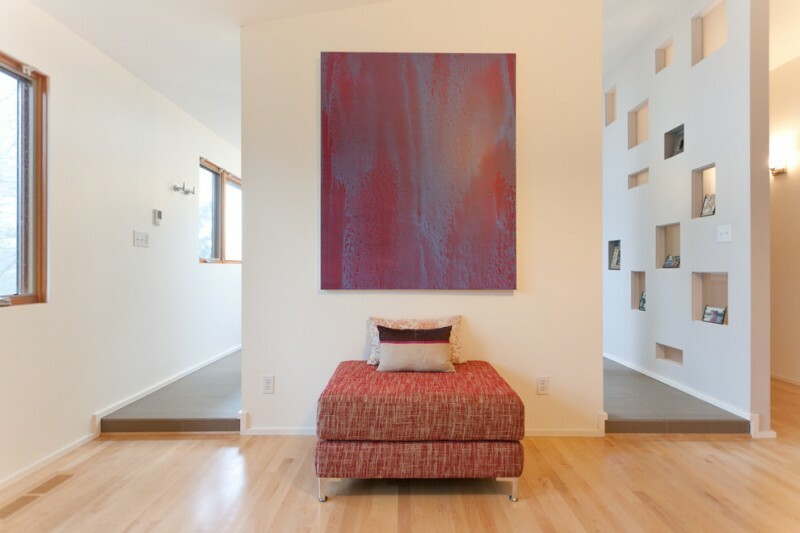 It’s so simple; just place a single backless couch between these two hallways, and garnish it with an artistic abstract painting over that couch. The easiest way to create a great architectural aesthetics, right? It’s nice choice to have some cups of coffee with friend or lovely spouse here. With a couple of wood chair comforted with fluffy foam seater, you’d get much of comfort during enjoying your hot drink. Round-top wood table is likely perfect match for the chairs. Ultimate your moment with sufficient and warming lighting produced by this modern lantern precisely installed over your table. 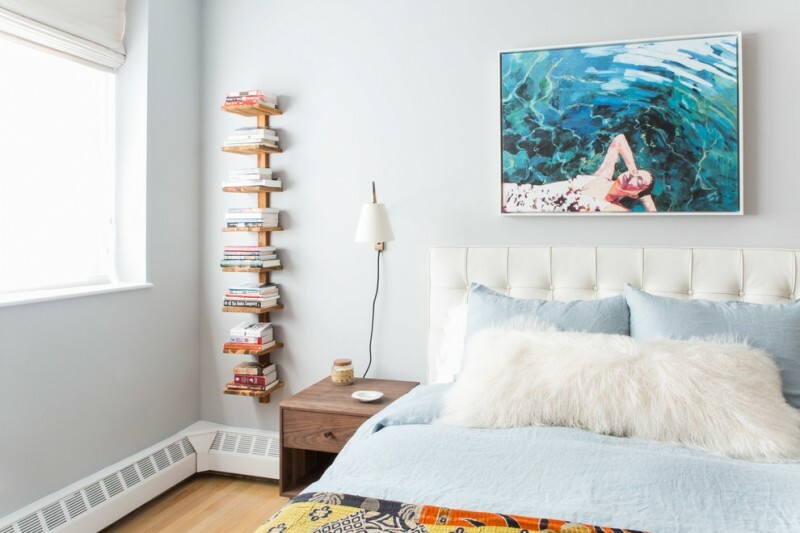 May be this vertical bookshelf has been the most interesting thing in this bedroom. Yes, it’s true. Most viewers must get their interest to this unique book display. If you’re interesting in it, probably it could be ordered in custom. 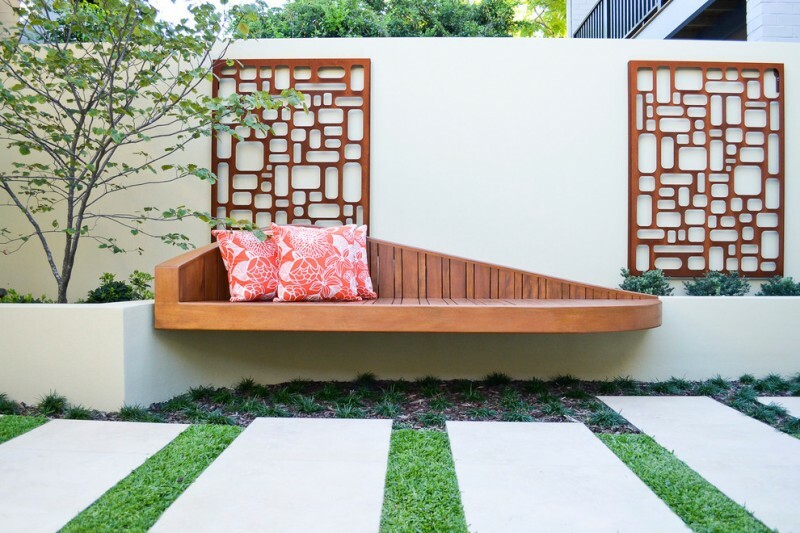 Asymmetric floating bench with throw pillows surely give you a cozy place to sit, and net-look-like wood partitions on wall here are just the ornaments. This spot is truly offering plenty of warming sunlight for having a delish breakfast with your lovely spouse. At night, it provides a dramatically romantic space for you two with some cups of tea. Interior landscaping idea with deck furnished with several comfy seats and a central firepit – a good option for you guys who love privacy.